Professional carpet cleaning machines make use of some of the latest technological innovations. Not only are there a host of options at your disposal, but these units are capable of tackling even the most challenging tasks. However, there efficacy is directly determined by the operator in question. This is why it is important to appreciate some basic usage guidelines. What expert advice should you keep in mind and are there any practices to avoid? Regularly cleaning the brushes and any associated squeegees. Examining the filters for any signs of a blockage. Regularly rinsing out the reservoir used to house cleaning fluid. In addition, always refer to the owner’s manual to determine if any additional steps need to be taken. Modern carpet cleaners come in all shapes and sizes. Each of these is intended to perform specific tasks or to deal with certain environments. In other words, the concept of “one size fits all” is not relevant. Determine which variety is best suited for your requirements. Some models are designed with an upright configuration while others as supplied with hoses so that hard-to-reach areas can be cleaned. This is also why it is a good ides to consult with the professionals at CL Floor Care. They will be able to provide you with targeted advice while answering any additional questions. 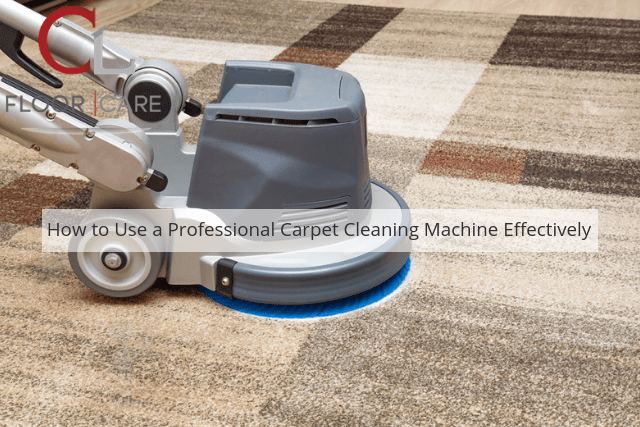 Many carpet cleaners are meant to be used in conjunction with a special cleaning solution. Never deviate from the recommended formula, as you might otherwise inadvertently damage certain parts of the machine (such as hoses, pumps or filters). Once again, it is important to consult with the owner’s manual or to speak directly to the manufacturer. These are some general tips which should always be employed if you hope to utilise your carpet cleaning machine more effectively. By adopting the proper techniques, you will be able to tackle challenging tasks and the integrity of the unit will remain intact. As always, please consult with a technician at CL Floor Care for additional advice.